Alcohol Awareness Month: How Much Do You Know? Did you know that alcohol is the most commonly abused substance in the United States? One in 12 adults, or 17.6 million Americans, have an alcohol use disorder or are dependent on alcohol. Millions of others exhibit problem drinking behavior, like binge drinking. Those with a family history of alcoholism have an increased risk of developing an alcohol use disorder. Not everyone who misuses alcohol will develop an alcohol use disorder, but it can still cause numerous health issues including cardiovascular problems, increased risk of cancers, psychiatric disorders, such as depression, liver diseases, gastrointestinal disorders, stroke, and unintentional injuries. 8 million worldwide deaths caused by alcohol annually. Alcohol addiction is the 3rd leading lifestyle-related cause of death in the nation. 40% of all hospital beds in the United States are being used to treat health conditions that are related to alcohol consumption. Binge drinking, which is drinking large amounts of alcohol in a short amount of time, is especially problematic among younger people. People between the ages of 18 – 34 binge drink the most, but it’s also a disturbing trend among high school kids. According to the National Council on Alcoholism and Drug Dependence (NCADD), 66.6 million, or 1 in 4 people, ages 12 to 17 reported binge drinking and the National Institutes of Health report two-thirds of high school students who drink, do so to the point of intoxication. A binge is defined as five or more drinks for men in a two-hour period and four or more for women in the same time period. Women metabolize alcohol differently, which is why the number of drinks is less. In fact, alcohol may be even more dangerous for women; the CDC says women who drink seven or more drinks in a week are at higher risk for heart disease, stroke and liver disease. The maximum recommended number of drinks for men is twice that amount. There are a number of dangers associated with binge drinking including, car accidents, falls, sexual assault, sexually transmitted diseases, unplanned pregnancy, violence, and alcohol poisoning. Alcohol poisoning can be deadly if left untreated. A person with alcohol poisoning has such high levels of alcohol in their body that it shuts down a their breathing and gag reflex. People die because they stop breathing or they choke on their vomit. If a person exhibits signs of alcohol poisoning, such as slow/irregular breathing, unconsciousness, confusion and vomiting, it’s important to call 9-1-1 or get them to the emergency room immediately. 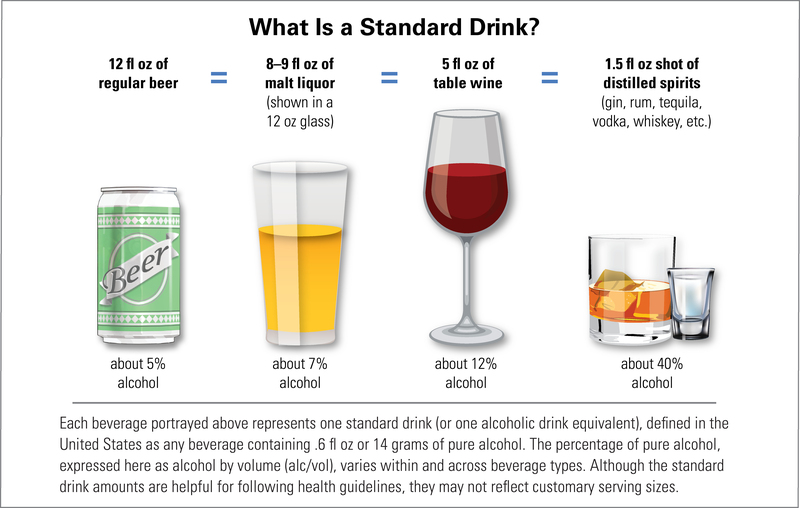 Is your drink the size of a “standard drink?” The National Institute on Alcohol Abuse and Alcoholism (NIAAA) created this chart below that outlines the defined standard drink sizes. If you go out to dinner and order a cocktail or two, how much are you actually drinking? Chances are, one of your drinks is more than a standard drink size, which means you may become intoxicated quicker. If you’re curious, they created a Cocktail Calculator to give you a better understanding of how much alcohol you are consuming. If you think you or someone you know may have an alcohol use disorder, educate yourself about the signs and symptoms of problematic drinking behavior. NIAAA has compiled resources to help you navigate treatment options and find treatment providers near you. http://liberationprograms.org/wp-content/uploads/2019/04/Screen-Shot-2019-04-16-at-9.49.34-PM.png 334 643 Katie Gallo http://016fd2f.netsolhost.com/wordpress1/wp-content/uploads/2016/06/liberation-programs-logo-ma.jpg Katie Gallo2019-04-17 01:56:232019-04-17 02:02:27Alcohol Awareness Month: How Much Do You Know? In honor of National Volunteer Week, we are highlighting one of our volunteers, Evelyn Morales. Evelyn began volunteering for Liberation Programs in August of 2017. She runs a weekly support group for the women in our Families in Recovery Program (FIRP). She shared why she volunteers with us and what she finds rewarding about her time at FIRP. We appreciate all of our volunteers and thank you all for your dedication to Liberation Programs and our clients. Why did you choose to volunteer at Liberation Programs? I chose FIRP because recovering from addiction is close to home. I grew up watching my Dad struggle with drug addiction and win his battle. My Dad was clean for over 25 years and was able to enjoy his family, grandchildren and great grandchildren before he passed away in 2018 from cancer. The mission of Liberation Programs is important to me because I believe any person who wants to break free from drug addiction can if they put in the work and develop a healthy support system. For me volunteering at FIRP is a way to give back what so many professionals and volunteers gave to my Dad and my family. What do you do in your volunteer role? I run a support group for the women at FIRP. The focus of my group is women empowering women and learning about healthy relationships with themselves, significant others, family members, friends and the community. What do you find rewarding about your volunteer experience? I find it most rewarding to be a part of the support system for so many courageous women who make the choice to go into recovery and put the work in to stay clean. As we know, recovery is an everyday battle and sometimes it takes more than one time in treatment to be successful in recovery. The woman at FIRP know I meet them where they are in their recovery and my goal is to empower them to empower themselves with the tools to succeed. Can you tell us about your career and what you do every day? I am a Bilingual Sexual Assault Crisis Counselor at The Rowan Center, a sexual assault resource agency, in Stamford, CT. A typical day at work consists of providing one-hour crisis counseling sessions to primary and secondary victims of sexual assault. I also provide advocacy to victims who want to file a complaint at the police department, court advocacy and hospital accompaniment for victims getting a forensic exam. We understand how drug abuse and sexual violence intertwine. For me personally and my colleagues at The Rowan Center, it is important to serve our community and provide our services and support to our neighboring program colleagues and clients. FIRP is one of our neighbor programs and together we make the difference in our community. Thank you to all the staff and clients at FIRP who warmly welcome me on behalf of The Rowan Center every week and allow me to give back to such courageous individuals. In the United States, more than 7 million adults struggle with problem gambling. Since gambling disorders are often misunderstood, the National Council on Problem Gambling proclaimed every March to be Problem Gambling Awareness Month. The goal is to increase public awareness and shed light on treatment options and prevention. One common misconception is problem gambling is just a bad habit or a sign of poor self-control, however, it’s a serious condition that can turn into an addiction and destroy lives. Gambling disorder is recognized by the American Psychiatric Association’s (APA’s) Diagnostic and Statistical Manual of Mental Disorders (DSM-5) and is defined as repeated problematic gambling behavior that causes significant problems or distress. Although a person might be a frequent gambler, it doesn’t mean they have a disorder. In order to receive a diagnosis of gambling disorder, a person must exhibit at least four of the criteria below within the last year. Although gambling doesn’t involve ingesting a substance, it produces similar effects on the brain as drugs or alcohol. Research shows that a person with one addiction is at an increased risk for developing another; many people with a gambling disorder also have a co-occurring substance use disorder. According to a 2005 study, 73% of pathological gamblers also have an alcohol use disorder and 38% misused drugs. This isn’t surprising since alcohol is handed out at casinos across the country. Just like a person addicted to drugs or alcohol develops a tolerance over time, so does a person with problem gambling. They need to bet more money and gamble more often to get the same emotional effect. As tolerance builds, a person develops an addiction. Since it isn’t uncommon to develop more than one addiction, it is advised that people in recovery for substance use disorders also avoid gambling. When the reward centers of the brain are triggered by gambling, it could cause the person to crave drugs or alcohol, which could result in a relapse. In addition to co-occurring substance use disorders, as many as 96% of people with a gambling disorder also have at least one psychiatric disorder. Studies have found 60% of problem gamblers have personality disorders, more than 50% have mood disorders, and more than 40% have anxiety disorders. Treatment is available for problem gambling, but according to the APA, only 10% of receive treatment. Approaches to treatment vary based on individual needs, but often consist of cognitive behavioral therapy, psychodynamic therapy, group therapy, and family therapy. Co-occurring substance use disorders or psychiatric disorders will also be addressed. Call or send a text to 1-800-522-4700. Help is available 24/7 and is 100% confidential. March is all about women; it’s Women’s History Month and International Women’s Day is Friday, March 8, 2019. It’s a time to celebrate women’s achievements, raise awareness of bias and encourage people to take action for gender equality. When you think about gender bias, you probably don’t connect that to substance use disorders. However, gender plays a role when it comes to the effects of drugs and alcohol as well as treatment. The fact is, women experience addiction differently than men and they also have unique needs when it comes to treatment. Typically, such needs are not addressed by treatment programs, which prevents some women from seeking help. It takes less time and smaller amounts of certain drugs before becoming addicted. Women have more drug cravings and experience more intense withdrawal. Hormones can make women more sensitive to some drugs. Women experience different brain changes than men and more physical effects on the heart and blood vessels. Women are more likely to suffer from anxiety and depression, which increases the risk of substance misuse. Trauma increases the risk of substance misuse and women experience higher rates of trauma, including sexual abuse and domestic violence. According to Substance Abuse and Mental Health Services Administration’s (SAMHSA’s) National Survey on Drug Use, over 23 million Americans struggle with an addiction, but only 11 percent receive treatment. While there are many barriers to treatment, some are gender specific. Pregnancy, lack of child care, fear of losing custody of children, and other family responsibilities are some of the reasons women don’t get adequate treatment for substance use disorders. Liberation Programs’ recognized the unique needs of women and developed the Families in Recovery Program (FIRP), an inpatient program for pregnant and parenting women located in Norwalk, CT. The program began in 1994 and is unique in our region. It is the only program of its kind in Fairfield County and the only one in Connecticut where mothers can bring two children up to the age of 10 into the program with them. FIRP helps mothers overcome their substance misuse problems and acquire the skills and resources they need to provide safe, nurturing homes for their children, helping to break what is often a multi-generational cycle of poverty and addiction. While we recognize there is still a long way to go, we are proud to offer this program to women in our community. We hope other treatment providers across the nation will begin to integrate additional services, such as child care and transportation assistance, to make treatment accessible for anyone who wants help. Throughout Black History Month, our nation honors African-Americans who have made significant contributions to our country. Famous names such as Martin Luther King, Jr., Rosa Parks, and Frederick Douglass probably come to mind. As we close out the month, Liberation Programs would like to take an opportunity to introduce a few whose names may not be well known but who have made significant contributions to the treatment of mental illness and addiction. Dr. Maultsby was the founder of rational behavioral therapy, a type of cognitive behavioral therapy and counseling method. His work explored ways in which people can help themselves manage emotions and behaviors. In fact, his work helped make emotional self-help a legitimate focus of scientific research and clinical use. The type of therapy and counseling that Dr. Maultsby created is the first short-term drug-free technique of psychotherapy that produces long-term therapeutic results. presentations to national audiences on issues such as seclusion and restraint, intergenerational family support, and minority issues in public mental health. She is a recipient of Mental Health America’s highest honor, the Clifford W. Beers Award, and received a Lifetime Achievement Award from the Substance Abuse & Mental Health Services Administration (SAMHSA) for her distinguished leadership and her advocacy on behalf of trauma survivors. Intellectual disAbility Service. There he improved health outcomes and increased efficiency of service by adjusting the agency’s treatment philosophy, service delivery models, and fiscal policies. Evans spent the early part of his career in Connecticut as the deputy commissioner of the Connecticut Department of Mental Health & Addiction Services (DMHAS). In this strategic role, he implemented recovery-oriented policies that addressed healthcare disparities and increased the use of evidence-based treatment practices. care, the Dr. Nathan Davis Award for Outstanding Government Service. In 2013, Evans was also recognized by Faces and Voices of Recovery with the Lisa Mojer-Torres Award for his dedication to mental health advocacy. Lawrence S. Brown, MD is the Chief Executive Officer of START Treatment and Recovery Centers in Brooklyn, NY. Prior to this role, Dr. Brown led prominent organizations in the addiction treatment field. He served as President and Chair of the American Society of Addiction Medicine (ASAM), as Chairman of the Board of the United States Anti-Doping Agency, and as a Board Member of both the College on Problems of Drug Dependence (CPDD) and the National Black Leadership Commission on AIDS. Dr. Brown’s scientific contributions have resulted in the publication of over 100 peer-reviewed articles, chapters, and abstracts that focus on complications that stem from addiction and improving treatment of substance use disorders. He is the recipient of the Addiction Medicine Physician of the Year Award from The New York State Office of Alcoholism and Substance Abuse Services. He is currently a member of SAMHSA’s Drug Testing Advisory Board and he is a fellow of the New York Academy of Medicine, the American College of Neuropsychopharmacology, American Society of Addiction Medicine, and The College on Problems of Drug Dependence. He also serves as medical advisor to the National Football League. These individuals have dedicated their lives to improving treatment and services for those impacted by addiction and/or mental illness—and they made significant contributions along the way. They are pioneers in our field of behavioral health, and we are grateful for their leadership. February 17, 2019 is Random Acts of Kindness Day. While it’s great to do nice things for others, it’s important to remember to be kind to ourselves too. Chances are, you are much nicer to a stranger on the street than you are to yourself. Think about the conversations you have in your mind throughout the day. How do you talk to yourself? It might not seem like a big deal, but that narrative in your mind shapes many aspects of your life, especially when you are in recovery. Most people who become addicted to drugs or alcohol began using substances to feel better. They try to suppress insecurities and negative feelings, such as anxiety, worry, fear, depression, and loneliness. What starts out as a coping mechanism to make it through the day turns into an all-consuming addiction, leaving a person with very little self-esteem. Why does it matter if you’re kind to yourself? It matters because you need to believe your life is worth fighting for in order to be successful in recovery. Find a mantra or affirmation that resonates with you and repeat it to yourself every day. Wear it on a bracelet, put the words on your mirror or say them in your head while you drive. It might feel silly, but even if you don’t fully believe the words you’re saying, your attitude will shift and become more positive over time. When you try to change a behavior or thought process, it feels like you’re putting on an act, but you have to go through the motions before it becomes habit. Science supports the “fake it til you make it approach! Nobody is perfect and you shouldn’t hold yourself to unrealistic expectations. Stop beating yourself up for your past. Doing so actually can trigger a relapse. Instead, let go of the past, forgive yourself and focus on the present moment. That’s easier said than done, so it’s best to work with trained therapists who can help you work through feelings, accept the past for what it is and move forward. Decreases pain by producing endorphins in the brain. Improves depression by stimulating the production of serotonin, which acts as an antidepressant. Are you inspired to perform a random act of kindness? Here are some ideas to get you started. Last month I talked about the importance of increasing access to treatment and doing whatever we can to save lives. In order to do so, we must provide people with all evidence-based treatment options available, including medication-assisted treatment (MAT). Although medications have been used to treat opioid withdrawal and addiction for decades, there is resistance among the treatment community and patients. According to the American Society of Addiction Medicine, only 30% of treatment programs nationwide offer MAT and less than half of eligible patients receive medication in treatment programs. I believe we have an obligation to offer MAT to our recoverees because it’s the best option for sustained recovery. In fact, studies show that 90% of people in recovery for opioid addiction will relapse within the first year without one of the approved MAT medications. It’s important to note—medication assists treatment— it is not a cure. Recovery is an active process that requires psychosocial and recovery supports. In addition to medication, individuals must learn skills to cope with life and regulate themselves and their mood without substances in order to succeed in recovery. MAT is the use of medications, in conjunction with counseling and other behavioral therapies, to treat substance use disorders and prevent overdoses. The most common medications used for MAT are methadone, buprenorphine and naltrexone. Methadone and buprenorphine both suppress opioid withdrawal and reduce cravings by acting on the opioid receptors in the brain, without producing euphoria. Naltrexone works differently; it controls withdrawal and cravings by blocking the receptors, eliminating the euphoric effects of opioids. Overdose deaths have steadily risen over the past 40 years, as noted in Science Magazine, which has forced us to rethink treatment approaches. As a result, more people are coming to understand the value of MAT and the role it can play in a person’s recovery. In 2012, the prominent addiction organization, Hazeleden, realized the benefits of MAT and incorporated it into their treatment facilities. More recently, a New York Times article profiled a Tennessee-based facility whose leadership incorporated MAT into their program. Research has shown, when used at the prescribed doses, these medications don’t produce a high in recoverees; instead, they allow the person to function normally and increase the likelihood that they will remain in a treatment program. Additionally, the use of these medications reduces the risk of infectious diseases and criminal behavior associated with drug use. It also improves the chances that a person will be able to gain and maintain employment. As I have said before, at Liberation Programs, we do whatever we can to save lives. We understand that MAT plays an important role in recovery. I am happy to see that attitudes are shifting and becoming more accepting of this proven treatment. Many lives can be saved when we work together to decrease the stigma associated with MAT and educate people about its benefits. It is of no surprise to anyone reading this that our healthcare system is fragmented. Whether it’s intentional or by accident, we end up trying to fix problems one at a time instead of looking at the whole person. Behavioral health has a long history of doing this as well. As professional in the field, we separated treatment for alcohol issues from misuse of “other drugs” and we developed separate treatment facilities for psychiatric issues. Not surprisingly, the outcomes were not what we hoped they would be. Liberation Programs, like many behavioral health organizations across the country, discovered years ago that treating issues in a silo makes for bad medicine. Whether someone drinks to excess, uses cocaine, takes too many pain pills, can’t find the energy or motivation to get out of bed in the morning, or can’t function at their job due to overwhelming feelings of anxiety, they share common links: emotional pain and a poor quality of life. That’s not to say that one type of treatment works for everyone. Liberation employs an array of different service providers in its system of care to offer specialized, targeted help. Whether it’s a psychiatrist, social worker, family therapist, professional counselor, certified addiction counselor, recovery coach or advanced practice nurse, the techniques are different – but the goal is always the same: ensure that people get what they need to feel better. Feeling better is the cornerstone of what Liberation offers. In a world that often asks the people who come to us for help to be “perfect,” “better” is an undervalued commodity. But it should be celebrated. I have a friend who participates in a local weight loss program. They celebrate every 10 lbs. lost. My friend has lost 30 of the 80 lbs. he needs to live a healthier, happier life. Does he have bad weeks? Sure. Do some of the pounds take longer to lose than others? Of course. But absolutely no one minimizes his accomplishments. Everyone encourages him to complete his goals and the entire helping team – no matter what the specific focus of their help is – works together to gently nudge him toward his ultimate goal. Sounds like a good model, doesn’t it? September is National Recovery Month, when the country purposefully sets time aside to celebrate stories of recovery from the disease of addiction. It also gives us time to review the proven methods developed over many decades that have helped millions of Americans improve their lives. Liberation Programs will be hosting a number of events ourselves and are proud to be part of this national movement to recognize that recovery can, and does, happen. But there’s always some trepidation as we approach September. We worry if our message of hope is lost somehow in all the statements that get bandied about so easily, with little exploration of accuracy. I’m sure you’ve heard some yourself. I know I’ve been in public forums where I’ve heard people say things like “only one in ten gain sobriety,” or “it’s not really a disease, it’s a lifestyle choice,” or more shockingly in 2018, “recovery medication is a crutch” (try saying that to a loved one suffering from high blood pressure, diabetes, heart disease or the litany of other chronic lifelong illnesses aided through medication). The truth is that recovery is not elusive. Not at all. Difficult, sure. Requiring patience, vigilance and support, check. But every minute of every day, it happens. Recovery isn’t some fleeting thing, outside the grasp of those who strive for it. Recovery is all around us. We are surrounded by it. Liberation Programs serves about 1,200 people each day. Come and take a tour with us in any of our facilities. Talk with people enrolled in one of our many programs. Listen to what they say and you will be amazed. The number one response I get after a tour is “I can’t believe how normal the people are. They seem happy.” It’s true – people in recovery are often happy and we celebrate that!